Sharks, grizzly bears and big cats may strike fear into your heart and limbic brain, but they do not even come close to being the deadliest animals on earth. Of the top ten deadliest creatures to humans most are smaller than a silver dollar! One of the few with scary fangs will likely surprise you. Another of these deadly animals lives in every person’s home and another is extremely common in our communities and often sleeps in our beds. According to the Bill Gates Foundation, the five animals that are in positions 10 through 15 for deadliness are more likely to be the animals that make the hair on your neck stand up, but they barely make a dent in the human population compared to the animals ranked 1-9. Two of the deadliest animals that seem like obvious candidates are snakes and crocodiles and indeed they rank number 3 and 10 respectively. 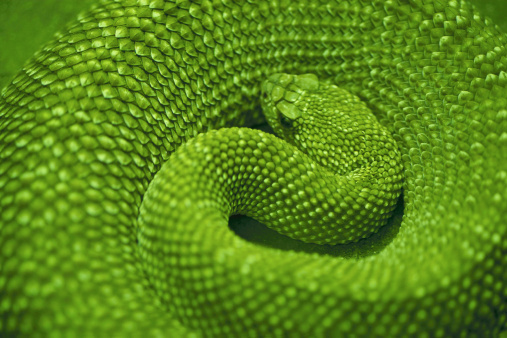 Snakes kill about 50,000 people per year worldwide. 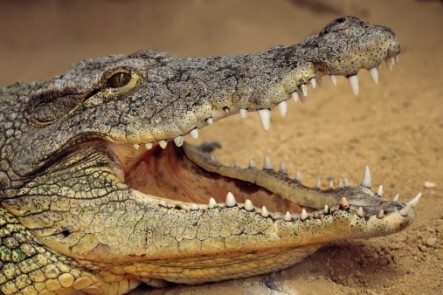 Crocodiles, compared to snakes, are nearly docile with only 1,000 deaths per year. So who are the other top killers? Take a look at the chart below. 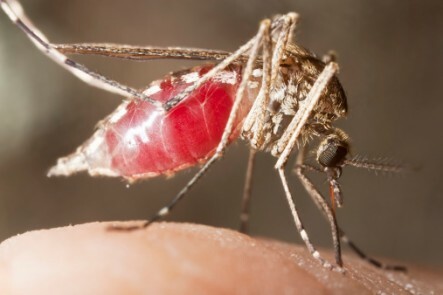 As you can see mosquitoes are not just annoying little buzzing, biting bloodsuckers, but they also transmit a handful of very deadly diseases. In fairness, it is not actually the mosquito that kills you with its probing proboscis, but rather the pathogens that enter your body when the mosquito feeds. 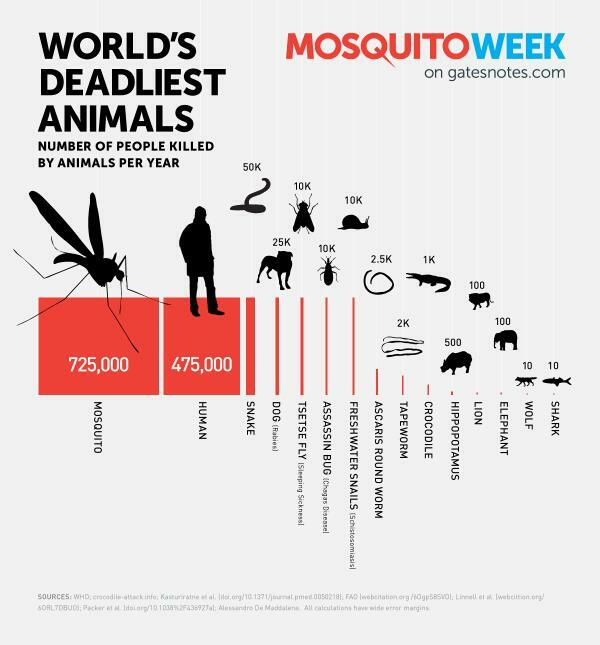 Every year about 725,000 people die due to mosquito-borne illnesses like malaria, which is why the Bill Gates Foundation made this infochart; they hope to bring increased global awareness of the deadliness of mosquito-borne illnesses. Our own species claims second place, demonstrating once again that we are often our own worst enemy. Humans kills about 475,000 other humans every year. Since there are over 600 venomous snakes in the world and they have a habit of slithering silently in the places co-habitated by humans, it is not surprising that these reptiles claim 3rd place in the deadly competition. It may or may not surprise you that man’s often-declared best friend is also one of man’s biggest killers. Every year dogs kill about 25,000 people worldwide. 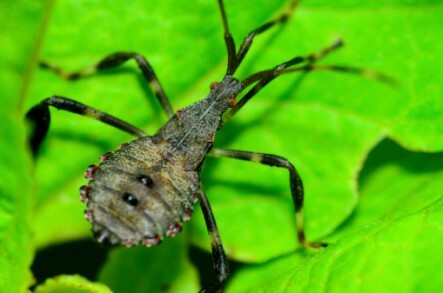 Freshwater snails, assassin bugs (also know as kissing bugs) and the tsetsefly tie for 5th, 6th and 7th place as they all claim about 10,000 lives each per year. Freshwater snails found primarily in tropical and semi-tropical bodies of water spread schistosomiasis. 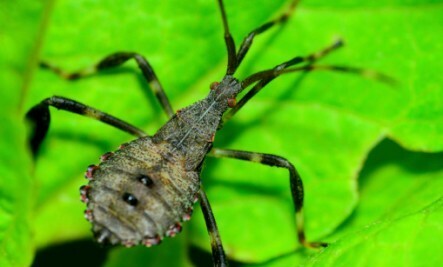 The assassin bug spreads Chagas disease to about 7 million people in Central and South America, of which about 10,000 per year do not survive. The tsetsefly also know as tik-tik flies causes trypanosomiasis (also known as sleeping sickness). The loopy ascararis round worm claims 8th place. 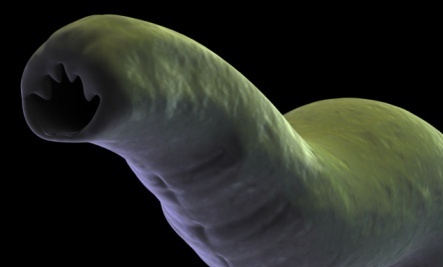 This parasitic nematode infects about 1/6th of the world’s population and claims about 2,500 lives per year. Infections occur when a human swallows food or water contaminated with roundworm eggs. Another worm claims 9th place—tape worm. Eating undercooked beef or pork is the major cause of transmission. Many people can merrily live their lives and have no idea they are hosting the parasitic tape worm while others can die from the infection. That brings us to number 10—crocodiles. About 1,000 people per year die unfortunate deaths involving these large aggressive reptiles. Following crocodiles are five additional large toothy animals that most people have the good sense to give wide berth when encountered in the wild—hippos, lions, elephants, wolves and sharks. Unfortunately, some people do not, and dozens are killed by these animals each year. Did any animals on the list surprise you? Have you had any scary encounters with one of the above animals? Hello everyone, i have seen so much but i just want to say few words as i am very excited.contact Dr. Edionwe for prevention and cure to any disease and sickness. he helped me and my family to escape the deadly herpes disease that killed many people in my town. you can reach him via email; edionwesolutiontemple@gmail.com so you and your family can be free from any disease and virus that might come your way. you need a spell to bring back your lover, you need a spell to get pregnant fast,miracle money or job, contact him today for any problem at all, i am sure he has a solution to everything. i have tasted and seen, i know many people out there are struggling to get over something. contact him via email: edionwesolutiontemple@gmail.com and you will be sharing your own testimony after few days. Thanks for the interesting info. I was surprised to see that mosquitoes claim so many lives. Obrigada pela informaÃ§Ã£o nao fazia ideia que haviam tantos animais mortÃ­ferosð.